An early deficit and an incompatible evening from the free-throw line combined to cut the Bulldog basketball team’s District 4-AAAAA Tournament run short Tuesday at Bulldog Pit. As head coach Michael Mondragon pointed out prior to the contest, topping the same team for the third time in a single season is always a difficult task, and the ‘Dogs struggled early from the field against Lovington. A 15-4 run through the first seven minutes of the opening quarter saw Artesia down by 10, 22-12, going into the second. A solid second period brought them back into the mix, but despite trailing by just a pair at the break, it was an uphill battle from there for the boys in orange. 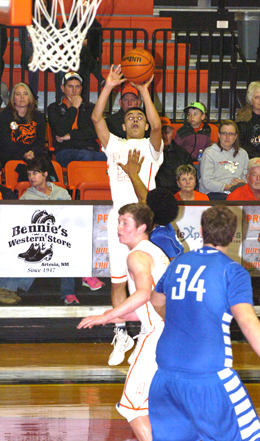 The third quarter was a disjointed affair in which Artesia was unable to establish a rhythm. The Wildcats weren’t whistled for their first foul of the half until the fourth quarter, and Lovington shot 23 of their game-total 26 free throws in the final 16 minutes compared to nine attempts by Artesia, four of which came in the last 23 seconds of the contest. Combined with a seven-point third quarter, it was too much to overcome, and Artesia was knocked out of the D4 Tourney by a final of 69-62. It was a frustrating evening but one the Bulldogs can learn from as they turn their sights now to the ultimate challenge: the Class 5A State Tournament. “I really don’t think we played our best game of basketball last night,” Mondragon said today. “I feel like our effort wasn’t there consistently, the energy wasn’t there, and we just picked a bad time to play a bad game. It happens. The ‘Dogs came out sluggish in the early goings Tuesday. Joe Willingham broke the seal, but Artesia wouldn’t score again until the three-minute mark on a shot off the glass by Caleb Brewer. By that time, the ‘Cats had already compiled a double-digit lead. The Bulldogs fought to gain ground, however, as Carlos Caldera drained a trey and Carlos Carrasco hit a pair from the stripe to cut Lovington’s lead in half, 18-9. Another Willingham bucket and a free throw from Justin Houghtaling made it 22-12 heading into the second. The ‘Dogs showed no signs of panic, regrouping to get their offense and defense working in tandem. Forcing six Wildcat turnovers in the quarter, Artesia shot 63 percent from the field in the second to put the ‘Cats on their heels and earn a fresh start in the second half. Houghtaling opened the period with an old-fashioned three-point play, and Willingham answered a layup off the steal by Lovington to make it 24-17. Caldera hit another three to bring the ‘Dogs within six, then – following a pair of Willingham buckets in the paint and a jumper by Taylor Null – went on a tear, following a shot from the free-throw line with back-to-back steals and breakaway layups, and finally, his third longball of the night at the two-minute mark. With that, the Bulldogs took a 35-32 lead but lost it in the final moments to five unanswered points from the ‘Cats. A Houghtaling basket to start the third knotted the game at 37-all, but following five more from Lovington, a layup and a trey by Caldera were sandwiched by trips to the line for the boys in blue, and Artesia – getting no calls in the paint – saw its scoring drop off for the final four minutes of the quarter. That led to an eight-point deficit going into the fourth, 50-42. Three points from Houghtaling and a layup by Chaney Hardt cut the gap to five, 52-47, early, but the Wildcats got by with a walk to set up an Isaiah Hinson and-one, and two from the stripe by Matthew Salazar were followed by a technical foul call on – you guessed it – Artesia and two more, all of which saw the ‘Cats back to a 10-point lead, 59-49. A jumper and a three by Caldera and one from beyond the arc by Carrasco helped pull the ‘Dogs back within seven with just under two minutes to go, but after Lovington went 3-6 from the stripe, a running layup by Carrasco, a Houghtaling free throw, and both ends of a one-and-one by Hardt could only round out the final, 69-62. Caldera finished a stellar night with 25 points to lead all scorers, including five three-pointers. Houghtaling and Willingham both posted 10, and Carrasco had nine. Allijah Ballard led the ‘Cats with 15, Gary Ornelas had 14, and Hinson finished with 11. Although the Bulldogs (11-13, 3-4) would have preferred to be playing out the district tournament, they’ll now have the remainder of this week and all of next to prepare for state. “From here on out, it’s win or go home, and I know the boys are fired up and anxious,” said Mondragon. “We’re one win away from The Pit, where we were last year, and now we have an opportunity to fine tune for that first state game. 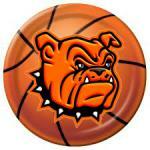 The state brackets will be released Sunday, and Mondragon anticipates a 13 or 14 seed for the Bulldogs. “I feel like that’s where we’re going to be, but if we’re 16, we’re 16 – as long as we get in there somewhere, we’ll be ready to play,” said the coach. “We’re not done. Like we told the boys, we still have a lot of work to do, but I really feel like we can beat anybody in the state if we play basketball the way we’re capable.